Held the third weekend of each month, the market thrives. 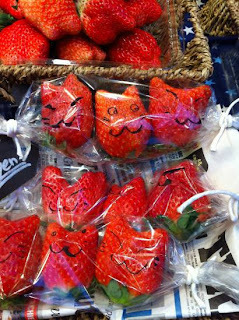 (Even as I chatted with market manager, what's-her-name, I had to keep a careful eye on the "strawberry cats" I'd spotted earlier.) Small but with good variety, visitors will find fifteen to twenty vendors set up under bright red awnings. Kids are guaranteed a bit of fun as well with a hands-on crafting activity. The market may be done for this January, but watch for it as part of the monthly schedule of Tokyo farmers markets and plan to head on over. Directions: Head out South Exit of Kichijoji Station toward Inokashira Park. Cross the small street and continue south to the park. You'll see the market at the next large intersection just in front of The Body Shop on the first floor of the Marui Department Store. Those strawberry cats are such fun!